The DANGER Report – Poorly Qualified Agents are more the rule than the exception! In an industry where practitioners (agents and realtors) own actions have increasingly caused concern about the quality and value of agents from the general public’s perspective, it is nice to see that concern has been reported to the major industry trade association – (NAR) the National Association of Realtors. The comprehensive report was recently released and distributed to industry associations, realtor boards, mls systems, and brokers and agents – it allows the industry to take a sobering internal look at present problems and possible future events that can impact and even change the way real estate operates in the future – especially if the industry does not make appropriate changes. To NAR’s credit, they commissioned the DANGER report which was performed by the independent industry think tank the T-3 Group headed up by Stephan Swanepoel to assess the current state of the real estate industry and develop a list of impending threats to the real estate industry as a whole, and categorized these dangers by the level of impact, the likelihood of the event, and time frame the event might make an impact. The Number 1 Danger to The Industry – Incompetent Agents! The report found that a vast number (several sources report up to 80% or more) of typical real estate agents are marginal – only work part-time, are poorly trained, unethical, and/or are incompetent! This group of substandard agents drags the industry down – this causes agents everywhere including the professional agents to be viewed as less credible. 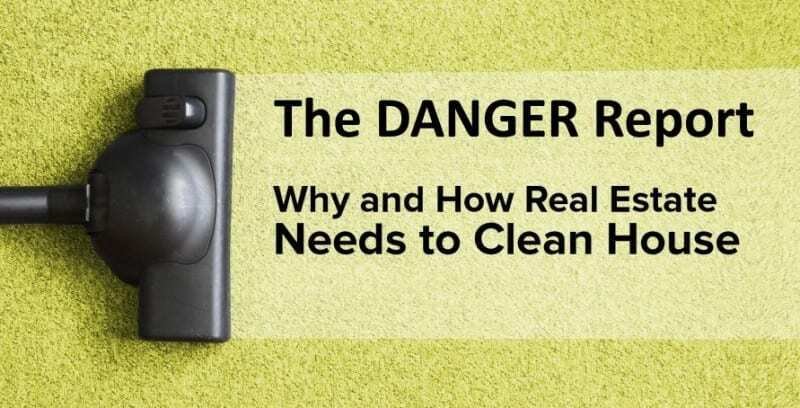 This is a report for the industry, but buyers and sellers should see it too – view the Danger Report. This huge number of poor quality agents not only pose a danger to the unsuspecting (and in many cases irresponsible) public that hire them – but they tarnish their own industry and harm the image of all agents (the 20% of “good” agents who are competent and caring.) That is why it has become increasingly important for the elite level agents – those who have transcended the role as salesperson/generalist to become true Expert Advisers (a group that number less than 5% of all agents) to articulate their value proposition and DISTINGUISH themselves from the 80% of bottom feeders! As the report states, this huge percentage of poor quality and incompetent agents threaten the long term viability of the real estate industry itself. Unfortunately, if the buying and selling public don’t begin demanding more, (and that is a problem in itself) internal changes are unlikely, and the status quo will likely remain for a while to the detriment of the public and the industry. Problem 1. The largest by far – the bar to entry into the real estate field to become a licensed agent is and has been far too low – and the industry does not seem interested in improving the educational standards and requirements, because that would eliminate a lot of dues paying members – including those that got in for the wrong reasons and never should have gotten a license. This includes all the bored homemakers, laid off and broke ex employees, restless retirees, and others who get into the business everyday for all the wrong reasons and then leave within 18 months or flounder on. The wrong reasons are: greed – looks like easy money…desperation – I need a job…boredom – I need something to do…no concern for the public – I want a job I can do on the side – part-time, (regardless of how my unavailability impacts my clients and other agents), etc. People who aren’t passionate about this business and helping other people, who aren’t committed to being their best, and who aren’t properly funded and prepared to make the investments in business systems and training needed to succeed and DIFFERENTIATE themselves from the masses of inept agents are destined to fail. These are the ones who hang in for a year or two or three and call themselves agents, yet barely do a transaction or two or none, and are a definite cancer on the industry! Significant added requirements are the solution – that would reduce the ridiculous excess of so-so agent/salespersons we have today – (Atlanta has well over 40,000 agents) – but of course that would impact brokerage and association fees at every level and therein lies the problem – that’s why change will come slowly of at all from the industry. It’s so easy for people from all walks of life with no prior experience in real estate at all to become agents. I met a retired Lockheed avionics technician at a recent Negotiation training event, and he became an agent (with a major franchise firm) – simply because the agent who sold him his home suggested he become an agent and join the firm! The above leads to Problem 2. Membership Fees – brokers and MLS associations push constant recruitment efforts to drive fees and expansion for their firm – and affiliated agents get a bonus for bringing new meat on board their firm. With all due respect, this elderly gentleman was probably great at his job at Lockheed, but I could tell from his questions and general input, even after over 1.5 years of training with (a rapidly growing national franchise firm), a firm who has repeatedly tried to hire me, and IMHO has some of the best training programs out there – he was still a very green and poorly equipped agent with very little to offer a client besides allowing them to use his MLS search system, and getting them into the door of locked homes! To be fair he is not unique – like most agent/realtor events I attend, the same was true of about 80 percent of the class participants present that day who represented a cross section of all the major firms in Atlanta and the US – some of whom had been in real estate for 15 – 25+ years! Some of the real estate 101 questions asked at that stage of the game and years on the job were scary! The situation is absurd and change is needed! It’s just way too easy to get in – but it’ is not easy to make a living as most people find out – and fortunately many get out – but too many hang in and crowd the sidelines looking for a relative or friend in their “sphere of influence” to become the next victim customer! Considering the size of financial transaction that a home sale or purchase represents, it is egregious to let total green rookies into the business with only a 75 hr course and unleash them on the public – but it happens every day. Even hairdressers and cosmetologists, have more educational and licensing requirements than agents who may “help” someone transact to buy or sell a $500K home! Problem 3. Agents are independent contractors – and each one is like a mini small business – thus real estate is one of the few industries where there are no consistent standards of service – at any Brokerage! Because of IRS regulations regarding independent contractors, Brokers can’t tell their agents how to do their work – that would classify them as an employee, and that is a big no no. This is the very reason NO Brokerage firm has agent standards of service. Agents are left to design and operate their business how they want to – agents at the same brokerage can provide great service, inconsistent service, or extremely poor and incompetent service! This is why I have always cautioned buyers and sellers who are looking for an agent – that you never select an agent based on the firm they work for no matter how prestigious or large the firm may seem – not my firm Advantage Realtors, not Keller Williams, not Atlanta Fine Homes Sotheby’s – the agent firm is not a selection criteria – not when you understand how things work: It’s the Agent you hire, that will make or break your deal! The agents firm is not conducting and overseeing your transaction – the agent is! The firm is supposed to review agent paperwork for error and violations, but except to write the agent a commission check after closing, the firm doesn’t get involved at all unless serious things occur which cause a consumer or the other agent to complain – by then irreparable damage may have occurred. Problem 4. Agents are salespersons – many people and agents themselves attribute much more importance to the skills of an agent than they actually deserve – agents may call themselves anything – neighborhood specialist, market expert, number 1 in sales, blah blah, etc. The facts are, 95% of agents are nothing more than salespersons – that is how they are described on their GA License. There is also the inherent problem created because of the very nature of agents…of course every salespersons goal is to sell – obviously this can become a serious conflict of interest when it comes to putting the buyer or seller clients interest first – ahead of the agents own interests – making the sale and getting to closing. Too many agents push homes, push transactions, and/or don’t disclose everything they know about a transaction – especially things that may change a buyer or sellers decision process if they knew about them. An agent who fails to disclose things they know that are NOT in the buyer or sellers best interest is a license law violation – but only if the buyer or seller is a client being represented in writing! Problem 5. Weak and desperate agents who are just scraping by – these financially desperate agents – especially the ones who come into contact with buyers and are so desperate for a customer they won’t even educate buyers on basic agency laws (a license law violation) and won’t ask a buyer to sign a Buyer Brokerage Agreement to become a client – in fear they may scare the buyer away! And if they do try to educate the buyer on agency relationships as required by GA Law, but the buyer refuses to sign a Buyer Brokerage Agreement, weak and desperate agents give in and work with the buyer as a customer rather than as a client – and in doing so the buyer is taking on the full risks for everything that might go wrong with their transaction – and except for provable fraud, they have little to no legal recourse against the agent for the outcome of their transaction! Top quality agents who know what they’re doing (and who care about their reputation) will insist on providing their best service and industry level advice when working with buyers and sellers – and by law, this can only be done when a client level relationship has been formed – which in GA must be spelled out in writing in a Brokerage Representation Agreement! Any agent worth their salt, will tell a buyer who does not want to sign a Buyer Brokerage Agreement, sorry but they are not able to help them! This takes strength of character to do what is right – and it takes having a degree of success in your business so you can pick who you work with and who you don’t. Desperate agents don’t have success and they have no value proposition so they chase prospects rather than the other way around. They don’t have respect, so they have prospects who don’t listen to them, who research sites like Zillow etc, and who then think they know as much or more than their agent! What a miserable way to work. Regardless, at the end of the day, as agents and Brokers, we know (or are supposed to know) the law and are supposed to be the experts, and protect the public – even if that means politely telling a prospect “because you refuse to allow me to give you my best, I simply can’t help you.” These weak and desperate agents are not good for anyone – they will agree to “work” with anyone under any circumstance, including circumstances they know to be bad for their buyer customer. They let uninformed buyers tell them how to run their business, and they pose the most danger to the public in real estate transactions. That type agent is egregious – and what the DANGER report is all about. Buyers who use this kind of agent frankly deserve what they get. There is too much free information on the internet about the difference between being a customer and a client and learning how to protect yourself as a buyer when working with agents, is not rocket science. Of course far too many buyers start their home search out all wrong – they spend all their time in the MLS ‘candy shop window’, looking at homes on their own, rather than first learning how to find the best expert to assist them in getting a properly targeted home search set up, and making life much easier for themselves. I agree, it’s more fun to look at homes, than it is talking with and vetting a few agents. But in the long run a skilled agent can make their lives so much easier – and an true expert level agent can give invaluable market insights and put them light years ahead in their search process – and give them an edge over their competition – other buyers. Problem 6. Ubiquitous internet IDX home search portals – most agent IDX systems require log in at some point – but some agents don’t require buyers to log in ever (thinking they will get more “leads”). (What kind of “lead” do you have if the visitor did not leave a real name, email address, and number – nothing?) Are we in business to let the buyer find their home on their own, or are we here to give them direction, help them see all options, and help them find the best home, and get the best deal? If not why don’t we just give the buyer our super key so they can let themselves in too? Being facetious of course! The result of giving a buyer the MLS rather than helping them with it, agents are helping buyers bring a lot of problems on themselves – too many buyers start the home search process completely backwards simply because they can – looking at homes first, rather than finding an expert who could set them up on a much better and more relevant and targeted search and keep them informed them about homes buyers would never find on their own. Instead some agents have taught buyers to be DIY’ers – to spend weeks and months combing the internet on their own looking at and for homes, and meanwhile they miss a lot of opportunities in the process, and take way longer than necessary to learn the market and find homes. Then once these DIY buyers find a home they think they like, at the last minute they try to select an agent often in great haste, to help them move forward on the deal they found before its gone, or worse they become scared or emboldened and take it on themselves to deal directly with the builders agent or listing agent – losing thousands in the process, and who knows what else. February 2017 Update – Trulia reported that Atlanta ranked 3rd in the nation for failed buyer transactions at over 10% of fails for all transaction annually – that’s over 7,000 failed transaction where someone did not know what they were doing! Problem 7. Most agents don’t have any DIFFERENTIATING value propositions and advantages – thus the vast majority of the public view agents as a commodity – they feel agents are mostly all the same and basically interchangeable (they never saw the Danger Report) – so operating under this flawed assumption too many folks pick their agent simply because they know them from church or they are the neighborhood agent, or because a friend or relative referred the agent – big, big, mistake if you don’t do your own vetting don’t blame anyone else when the wheels fall off! Problem 8. Most of the public don’t really know how to pick the best agent. Most of the folks who do understand that agents are not the same, and that it’s unwise, even irresponsible to just pick an agent merely because they know them or someone else referred them, often don’t understand how to vet an agent – what criteria to look for and use to determine who really is the best agent…and how to avoid the 80% majority who are so unskilled and incompetent as to be irrelevant, even outright dangerous to your financial health!